Well maybe not , it seems a little late to take such actions. 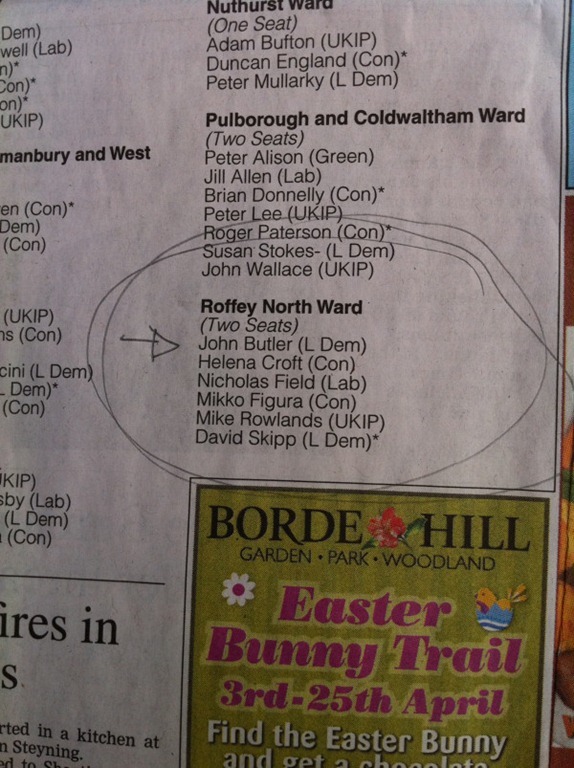 As the old joke goes “they spelt my name wrong” and in this case West Sussex County Times were printing a list of candidates by Ward and decided that I ‘Nicholas John Butler’ would now be reffered to as ‘John Butler’. 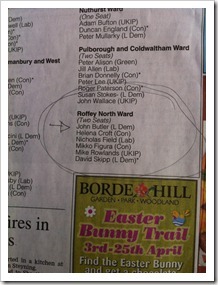 Okay it is not the end of the world when it comes to press exposure but I am pretty sure people looking down the list of names will not know that it is me standing for that ward , if only because I have rarely spoken about my other name , John. Meanwhile Anna Coe who helped in that article has accepted that a correction might be in order, I wonder if I might encourage her to accept one of those action photos ? There are, I am told, leaflets to be picked up and delivered door to door. Yes even in this wonderful age of technology we still find that actual bits of paper through a door will capture the hearts , minds and attentions of many potential voters. I note though that one or two people on twitter have commented that much of the paperwork they receive appears focussed on negative campaigning or explaining what may have been done differently. Just as it took a while for Marketing and PR to catch up with the conventions of the modern consumer so it is with Political Campaigning that there is a lag between where people are today and how parties will expect them to react. I think I shall stick to making a noise and keeping up the signal. ← An action man ?